Finally, huh? 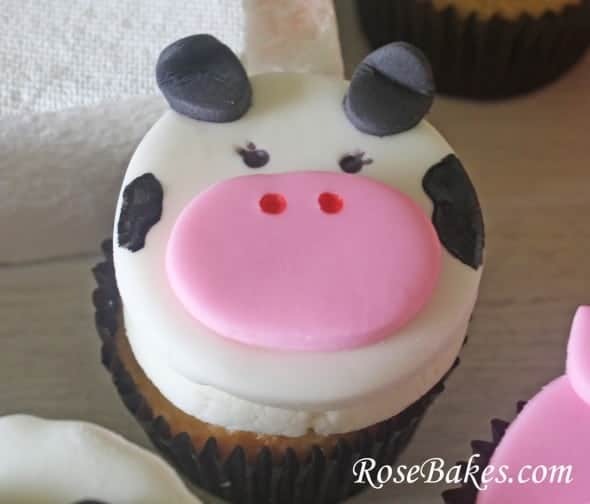 I’m going to finish up the Farm Animal Cupcake Toppers Series today with part 4: How to Make Fondant Cow Face Cupcake Toppers. And then tomorrow I’ll share the Barn Cake with you that goes along with these cupcakes!! Did you see Parts 1, 2 & 3 of the series? You can see them here: How to Make a Fondant Chick Cupcake Topper and How to Make a Fondant Pig Face Cupcake Topper and How to Make Sheep Face Cupcake Toppers. PS. I’d love it if you’d pin this post… just hover over the picture and the “Pin It” button appears in the upper right corner! Black, White & Pink Fondant; I used homemade marshmallow fondant (for the white and pink) and Satin Ice Black Vanilla fondant. The pictures are self-explanatory. Roll out the white marshmallow fondant and cut out 2″ round circles (I forgot to get a picture of this). Then cut out the pink oval (for the face) and the tiny black ovals (for the ears). You’ll want to slightly bed the black ovals to make the ears have some dimension (see #5). I attach the face and ears with sugar glue to the circle circle. After that, I drew on the nose holes and eyes with red and black markers. I gave the little cow some eyelashes just for fun! Then I painted on the spots – so she’d look like a spotted cow! And that’s it! If you like these, you may also want to check out my cow cake pops! Do you have any questions about these cupcakes? Please feel free to leave a comment and I’ll help if I can! One or more links in this post are referral and/or affiliate links. Read my disclosure policy here. These are so cute. I love this series….I love the eyelashes on the cows! 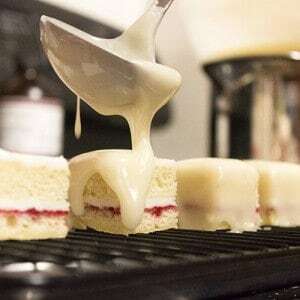 Your tutorials are great! Thank you for sharing. How many days in advance can you make the animals cupcakes and the animals cake pops before a party? You can make the animal face toppers several days or even weeks before your party… just don’t put them on the cupcakes until the day of or day before. When I make the faces in advance, I keep them on a cookie sheet with a lid (so I can spread them all out). Then I usually put them on the frosted cupcakes the night before or the morning of delivery. I’ve made the cake pops a day or two in advance, but never earlier than that, so can’t say for sure on those. You can make the plain cake balls/pops days in advance and freeze them (un-dipped) and then decorate them within the last day or two. I hope that helps! Thank you for your response. I really appreciate it. Hey Rose, I made all the farm animals toppers that you have tutorials for, for my son’s second birthday at a farm and I must say they came out excellent and everyone loved them, especially the bithday boy who is obsessed with farm animals, Your step by step instructions were easy to follow. Thanks you so much! You rock!